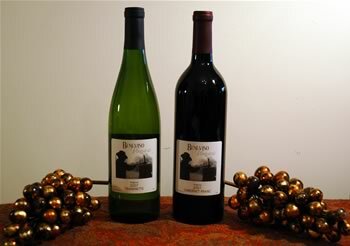 Benevino Vineyards has established a Quality Viticultural Practices program for each of its clients, to ensure that the best possible fruit is delivered to the vintner at harvest. Quality Viticultural Practices, as practiced by Benevino Vineyards, are quantifiable, so that they are defensible, replicable, and verifiable. Defense of a practice, which is specific to variety, initially follows from published research, but we may establish our own experiments in concert with participants. These will have expert oversight to ensure that our findings are defensible and have maximum grower applicability. A replicable standard is implementable by multiple growers. To illustrate, a practice defined as 5 to 8 cm2 of leaf area per gram of fruit is quantifiable, but hardly implementable by vineyard labor. A verifiable measure can be confirmed by an independent entity walking the vineyard. The practices have been drafted in the form of a checklist so that they can be implemented with a minimal questions or interpretations. Growers will be asked to certify that they have performed the practices at the schedule on the checklist. They will also be asked to prepare and submit a spray plan before the season. That plan will be reviewed by a trained professional for reasonableness. Because sprays are subject to weather, each grower will be required to submit his actual schedule at the end of the season. 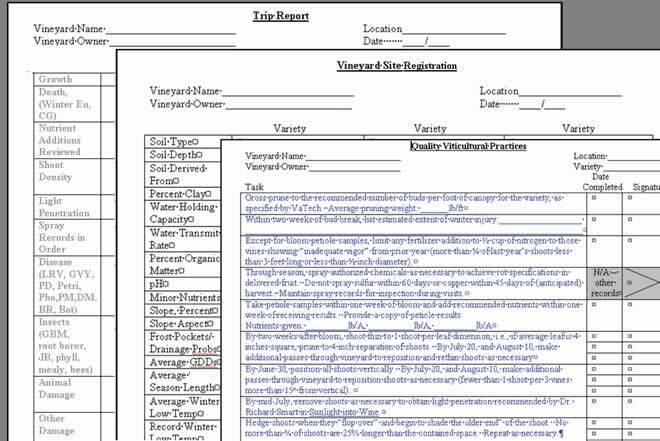 The practices checklist cites activities that are time-dependent, based on vine growth (e.g., within one week of inflorescent development, 80% cap fall, or 50% veraison). Thus, they can apply to multiple varieties. Varietal specific conditions (e.g., the amount of leaf pulling) are listed on a separate sheet. As noted above, because the practices are quantifiable, they can be verified. A trained Benevino Vineyards representative, independent of the grower, will verify by periodic trip report that activities have been performed to date, and will note any deviations at that time. Such advance notice should give the grower adequate time to respond to any issues, in order that the fruit achieve its maximum ripeness by harvest. At the end of the season, the proof of the grower’s efforts will be measured by grape chemistry metrics denoting ripeness; e.g., Brix, acid, and pH. These measures are included to ensure that each grower has reasonably matched variety, rootstock, and trellis to his site. For example, no amount of vineyard practices might produce quality Cabernet Sauvignon on a site receiving only 160 frost-free days (or less than 2800 growing degree days) per season. In addition, any quality program must rule out basic flaws, such as YAN, SO2, or MP in the lot delivered to the winemaker. The current practices are designed to minimize currently identifiable flaws. As the programs progresses, it is expected that growers and vintners will collaborate to include appropriate techniques to eradicate flaws that do arise.